COAST » Get Involved At Your School! For our Safe Routes to School (SR2S) Champions and Teachers: Here you will find all the guidance and resources you need. Our SR2S Coordinator is happy to provide assistance anytime. 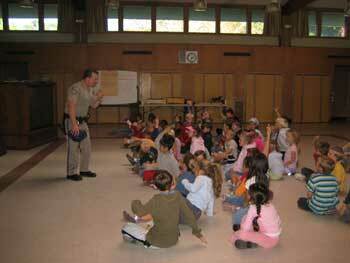 Some of the safety education events are offered only at elementary schools, but most of the program is for all ages. For our Walk to School Day Curriculum Guide (.PDF) for grades K-6, CLICK HERE. SR2S is most successful when school based “teams” made up of parents, teachers, administrators and neighbors work together on safety issues under the leadership of a “champion.” COAST can provide guidance in the formation of a SR2S Team at your school. “Every Child Deserves Safe Routes to School” [Microsoft Word]. This article helps identify interested parents at a school and can be modified to fit a school’s newsletter or bulletin. Safe Routes to School Overview [Microsoft Word]. Use this one-page handout to learn how to carry out the goals of SR2S and how COAST and other partners can help. Share the work plan with others at your school who may be interested in getting involved. Letter from Principal [Microsoft Word]. To initiate the Safe Routes to School program at your school, we request a letter of support from the school principal. The sample letter can be individualized. Safe Routes Checklist. These surveys are given to children and parents to record challenges along their own route to school. This information provides insight from the “kids-eye view” about what obstacles they encounter on their way to school and helps to prioritize potential access improvements. You can download an English Checklist or a Spanish Checklist version, both in Microsoft Word, and modify it as you require. You can also download an article for your school newsletter entitled “Safety Matters!” [Microsoft Word] to explain and precede distribution of the Checklist. Walking School Bus Guide [Microsoft Word] Download the Walking School Bus Guide to learn how to set one up in your neighborhood. Parents act as “bus drivers” picking up children at designated spots along the route to school. Kids get some exercise, arrive to school safely and get to know their neighbors! You can also visit www.walkingschoolbus.org. Bike to School Days – May. Event days help to build excitement about walking and biking to school. Participating schools create festive greeting tables, and hand out donated prizes and healthy snacks to children who bike to school on that day. We encourage parents to bike with their kids! Contact us if you would like to host an event at your school and we can help supply you with small prizes for the kids and provide tips for planning. Organize a Bike Train! A bike train is a great way to encourage biking to and from school that can involve multiple students from many neighborhood families. 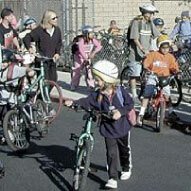 COAST’s Safe Routes to School program encouraged schools to set up bike trains for Bike (and Walk) to School Day. Several schools ran with the idea and have set up bike trains to school on a regular basis. Our partners at SBBIKE captured those bike trains on video. Click the right-hand image to watch and learn more! Walk to School Days – October. International Walk to School Days bring together more than 2.5 million people from 32 countries around the world. The idea is to walk to school together with a purpose – to promote health, safety, physical activity and concern for the environment. To celebrate this event, nearly 5000 South Coast students walk, bike, or scooter to school! COAST can offer guidance in planning and promoting your event and provide small prizes for students. For a listing of public officials you may wish to invite, please go to the “Contact officials” page of this site. International Walk to School Day in October is often the kick-off day for a school’s Walk & Roll campaign, with Bike to School Day in May being its final day. This is an ongoing weekly event that encourages students to walk, bike, scooter, skateboard, bus (or carpool) to and from school at least one day per week throughout the school year. The goal is to reduce traffic around schools, increase physical activity and reduce dependency on the automobile. The event can be a competition between classrooms or individual students, or no competition at all. Walking School Buses and Bike Trains (see above for video) are a great way to get this going and maintain a Walk & Roll program! The tip sheet below is intended to provide a framework for your event. Create the campaign that you, the organizer, can sustain all year long! Pedestrian Safety Assembly: 40 minutes. Geared towards children in K-3. Focuses on how to be a safe pedestrian and what hazards pedestrians need to be aware of. Presented by the regional Safe Routes to School coordinator. Neighborhood Walk-around: 25 minutes. Geared towards second graders. Often scheduled in conjunction with the pedestrian safety assembly. What the children learn in the assembly, they practice in a walk around the school neighborhood. Children are guided by the regional SR2S coordinator, a police officer (when available) and their classroom teacher. Bicycle Safety Assembly: 40 minutes. Geared towards children in 4th-6th grade. Focuses on the rules of the road for cyclists, hazards to be aware of and reviews the four most common reasons children in this age group get into bike accidents. Bicycle Rodeo: 60 minutes. Geared towards 4th graders. Participants need to be able to ride a bike. Local, certified instructors from the League of American Bicyclists teach this bicycle handling course. Two courses are set up on the school blacktop. One course is a linear bike handling skills course that teaches proper start/stop technique, straight-line riding, scanning and hazard avoidance skills. The other course is ”Safetyville:” a mock ‘cityscape’ complete with two-way ‘roads’ & intersections with directional arrows, stop signs, storm drains, simulated opening car doors and other hazards cyclists encounter on the road. This is a very safe, fun way for budding cyclists to learn the skills of riding on neighborhood streets. Children need to bring their bicycle in reasonable working condition and their helmet the day of the rodeo. A release agreement form is required for participation. Four to six school or parent volunteers are required to help with the bike rodeo. No bike experience is necessary for volunteers, but it is helpful. These events are best done annually so each class has the opportunity to experience the neighborhood walk-around and the bicycle rodeo. Low-cost Bike Helmet Distribution: 30-60 minutes. Typically scheduled after school at dismissal time. COAST SR2S staff and volunteers distribute and fit cool, multi-sport helmets. Or bring your helmet from home and we’ll make sure it fits properly. A signed waiver required if guardian is not present at the distribution. After the safety events, please distribute ‘Tips for Safe Walking and Bicycling’ so the safety discussion can continue at home. Download the PDF: English version or Spanish version. 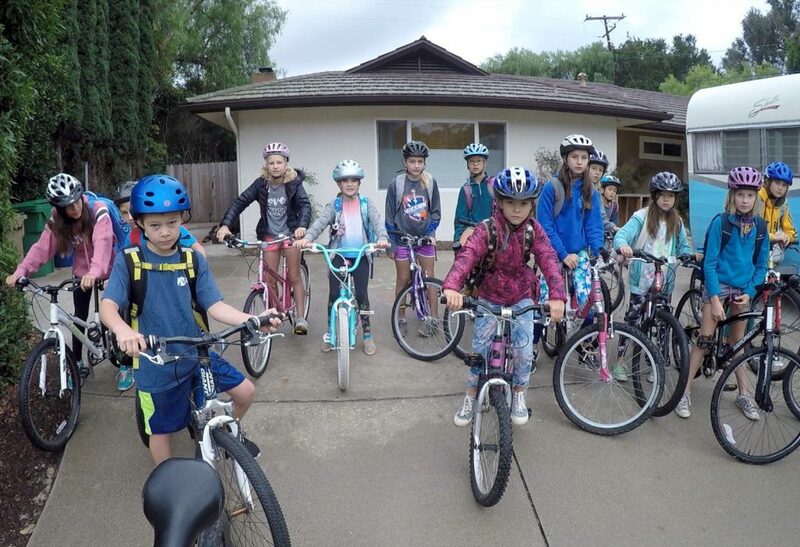 For information on after school bicycle safety classes or bicycle camps, please visit the Santa Barbara Bicycle Coalition’s website. Your Safe Routes to School coordinator can help you schedule a class at your school. The National Center for Safe Routes to School has a very informative site with a good Resources section. The Safe Routes to School National Partnership has an excellent site with many resources. It comes with a special California Page. The National Highway Traffic Safety Administration site has much useful information, such as toolkits and classroom activities.